There is also a local hostelry called the Railway Inn only a 1⁄4 mile from the shop, that has good food at reasonable prices and also really nice rooms to let, so visitors to Centreshot can make ‘a day or weekend of it’ if they so wish. Malvern is a small Market town very close to a number of very picturesque towns in Worcestershire, Herefordshire and Gloucestershire. Well worth a visit. The well stocked shop contains many of the main manufacturers’ bows and accessories, and Janice & Dave will always attempt to source any item that is not on the normal stock list and will aim to dispatch within 5-10 working days. WE ARE AVAILABLE FOR TELEPHONE ORDERS 9.00 AM TO 7PM MOST DAYS with the exception of Sunday and Wednesday evenings. 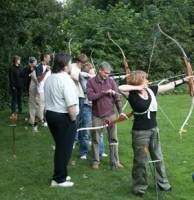 Janice and Dave started in Archery when, on holiday, a friend took them to Dunwich Forest in Suffolk to try their hand at field archery. They were hooked. On returning home they purchased equipment, but with no field clubs at that time in Birmingham, they joined a target archery club. 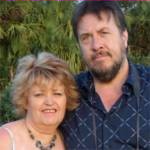 Both went on to compete at a high level with Janice shooting for Warwickshire, and eventually after moving to Malvern, Janice and Dave and their son Richard were all shooting in the Worcester county squad, with Richard eventually shooting in the Recurve team for the England squad. After a spell of injury Janice went on to shoot the compound bow, which became her forte. Since turning to compound she was a member in the county team for 10 yrs and has competed for her country in the Euro nations cup twice and also the Home Nations Cup to date. Janice also obtained the highest classification that can be reached in the sport of archery.. Grand Master Bowmen…. and achieved this for as long as she was competing, gaining 2 National and 1 European Record in target and 1 National record in Field along the way. Janice’s other love in archery is teaching the sport to others, whether at have-a-go days, full beginners courses or helping already established archers to raise their level of achievement, giving what she can, back to the sport she loves. With her husband Dave they have started a constant beginners course, (all year round) where they have brought many new archers into the sport. With Dave’s expertise in setting up and tuning equipment, recurve and compound, they have helped many more achieve a higher level in the sport. Dave and Janice consider themselves very fortunate to be able to own and run an archery retail shop, where they can support new archers, so that when they decide to acquire their own equipment, they can make sure that the bows they get, will be best suited to them and their budget. With their New updated ‘on-line shop’ they also hope to be able to help as many new and established archers as they can, from all areas, to obtain the right equipment for them, and that they will always be available via phone or email for any queries regarding equipment. To take the greatest of care in helping ,the newest of beginners in the choice of equipment, also to the most competent archer, if any advice is required in the purchase of new equipment and accessories . Most of all we wish you all. - We can take all UK credit /debit cards, but regret we are unable to take American Express directly by phone. ( This card can be used in conjuction with paypal.) We regret to say that due to our low prices and the charges we recieve from the banks there will be 50p surcharge for any card payment less than £5.00 paid directly to us by phone.